When I first decided to write my second birth story, I debated whether or not I should do it as one post or a series of posts. Ultimately, I decided that there was way too much to share in one post. So, for the sake of my time and your time, I came up with a mini series to share the different parts of the experience. If you haven’t read part 1, I recommend going here and starting at the beginning. Since I chose to be induced, we knew exactly when we’d be heading to the hospital. I kept hoping that he would surprise us and come on his own, but he had other plans. We were scheduled to be at the hospital at 6:30am. The hospital is about 45 minutes away, so this meant waking up around 5:00am. I wasn’t a fan of the time for many different reasons – including starting the day exhausted and not getting to say goodbye to Baby Fox. I tried to focus on the positives though and push aside my apprehensions about the task ahead. My mom, my husband, and I all loaded our bags into the car and were on our way with a little time to spare. The trip was rainy, dark, and quiet. I dosed on and off as best I could since I knew I would need energy later. It was a bit difficult though because I was starting to have more intense contractions. I’d been experiencing Braxton-Hicks contractions since the start of the third trimester and these were much different. In fact, I was just about to start timing them when we arrived at the hospital and they stopped. We headed up to Labor and Delivery where they already had a room ready and waiting for us. We went over the process of how things would go and filled out the necessary paperwork. The anesthesiologist came in with the paperwork for an epidural and I kindly let him know that one wasn’t in my plan. My first experience with an epidural was less than favorable and it was something that I didn’t want to repeat. He still asked me to sign the paper in case I changed my mind. I knew I wouldn’t but I signed them anyways. After all, you can’t predict how things are going to go. After the paperwork and other big things were taken care of, they started me on a low dose of pitocin and we settled in for a long day. I should note that I was already starting to dilate and efface at my previous appointment. This means my body was already starting to prepared for labor which was a factor I had considered when scheduling the induction. I played on my phone, read a little, and chatted with my mom and husband to pass the time. It didn’t feel like much was happening which was quite the disappointment. Around 8am, my OB showed up and did a quick check to see how things were coming. I was only 2cm dilated. This made my hopes for a quick labor disappear. Then, he looked at the machine and asked if I was feeling the contractions. I informed him that I wasn’t and he seemed a bit disappointed by this news. He headed out and said he’d be back by later to check on me. In the meantime, the nurse kept adjusting the pitocin as needed. I continued to pass the time by reading, going to the bathroom, and other odds and ends. Eventually, I started to feel contractions and they kept getting more intense. A pattern was starting to emerge with them but I wouldn’t say that it was a strong pattern. With each new contraction, I found myself repeating phrases such as “I am strong” and “I can do this” to help me get through them. My nurse came in around 11:30am to check me. I was hoping she would say I had progressed a lot and was very disappointed when she said I was at 5cm. I showed up at the hospital at 5cm with my first son and stayed there for a few hours before progressing further. I settled in for a long afternoon of enduring intense contractions. It wasn’t long after she left the room that my contractions picked up in intensity once again. I started to fill a familiar urge to push but convinced myself that there was no way. On the third contraction of intense pain and feeling like something more was about to happen, I announced “I think I’m ready to push.” My husband quickly left the room to get a nurse, not even stopping to question it. It was around 12:00pm. I could see the look on my mom’s face. It mirrored the thoughts that I was having – there’s no way I’m ready to push. I was just at 5cm less than a half hour ago. My husband came in with the nurse and I prepared myself to hear that I had progressed a little but still wasn’t quite there. Instead, she lifted the blanket to check and went “there’s the head” before turning to her companion and sending her to page the doctor. Suddenly, things were moving in high gear. The nurses were telling me to breath through it and not to push yet. My main nurse kept asking the other if she was sure she had emphasized that we needed my doctor here now. They continued to tell me not to push and I had a really hard time because the urge was intense. Within minutes, my OB was rushing into the room looking like he had just run a marathon. In many ways, I guess he had since he was at his office down the street and ran over to the hospital and up four flights of stairs to get there. My guess is that the urgency of the message had been relayed. As soon as he was in the room and ready, then the pushing began. I continued to tell myself random phrases to help me through the pain. Everyone around me was encouraging and telling me to push. At some point, the “push” messages got a bit more urgent and I felt a quick snip. I knew something was up because last time, my OB let me know before he did an episiotomy. I didn’t linger on this detail too long as I continued to push and listen to my body. Just when I thought I couldn’t do it anymore, I heard my doctor tell a nurse to get the vacuum ready in case we need it. This suddenly jumped me into high gear and I remember thinking “we are not using a vacuum for this baby.” The next thing I know, my doctor is telling me to give it one more big push so that we can get the shoulders out. I remember wondering when the head came out and why no one announced it like last time. Another quick push and Baby Owl was lifted onto my stomach and coaxed into breathing before my OB looked at me and apologized. When the nurse announced the time of birth was 12:21pm, I realized that a lot had happened in less than ten minutes. My hope for a quick labor and delivery had come true. I also made it through the whole thing without an epidural which was another thing I wanted. So, I mentioned that my doctor looked at me an apologized after my son was born. He apologized for the sudden episiotomy that came without warning. Then, he went on to explain that my son had his cord wrapped around his neck twice and his heart rate was dropping. Therefore, he made a swift decision to help get him out. 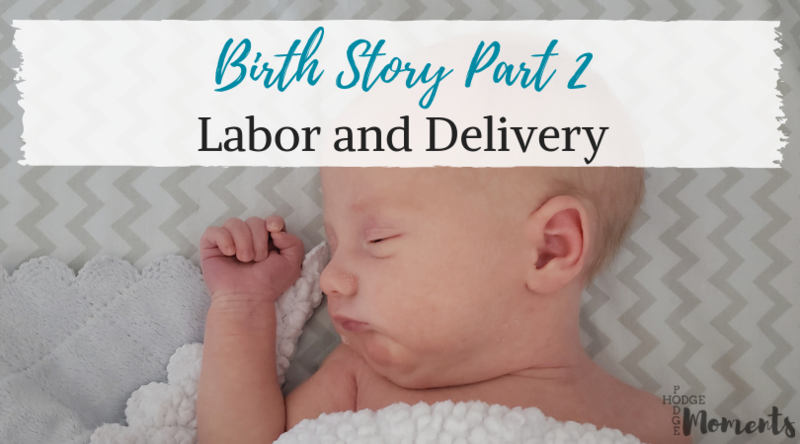 I didn’t fully understand exactly what had happened during delivery until my husband filled in a few pieces of the story later. I was focused on getting the baby out and the medical staff was focused on the same thing. I’m glad that no one mentioned the cord or heart rate until after the fact. I’m not sure if panic would have helped or hurt during delivery. We were talking later and my husband shared what he saw during the delivery. Baby Owl was coming out with his cord wrapped around his neck twice. His heart rate was dropping. The doctor swiftly snipped a bit of skin and literally reached in and helped get him out before removing the cord quickly. This is why I didn’t realize that the head was out. I thought my doctor was helping make room for my son to come. Instead, he was making sure my son was safe. After you give birth, there’s a recovery period where you bond with your baby and let your body rest a bit. The nurse cleaned up my son and the doctor stitched me up before congratulating us and leaving the room so that we could focus on our son. I can’t quite describe the emotions that were going on during recovery. There were so many things happening at once. I was thankful for a safe delivery. I was amazed that I made it through without any pain meds. I was happy that my son had latched on to nurse right away. I was empowered by the entire experience. All of the emotions were happy ones, which was a big difference from my first birth experience. My son had come into the world much faster than anticipated and this left my mom asking an important question – when would big brother be coming up to meet him? That’s a story for another day though. Tonight, I’m off to relax a bit while both of my little ones sleep. Absolutely beautiful. I am obsess with birth stories and I am so honored that I could read yours. So glad it went quickly and without any major complications. Congratulations again! Thanks! I’m still amazed at how quick it all went! It definitely is a surprise when they’re urgently calling for the doctor! I could tell that the nurse was really worried that she was going to be delivering a baby herself!